The 768,000 euro 918 Spyder hybrid is Porsche's highest priced vehicle. The automaker may introduce a vehicle priced just below this but above the top-of-the-line 911 variant the GT2 RS. FRANKFURT -- Porsche AG may develop a supercar positioned higher than the 911 GT2 RS to broaden its lineup and offer a model in a price range it believes it needs to fill. It would aim to fill the gap between the 237,600-euro GT2 RS, the top end of the 911 line, and the 768,000-euro 918 Spyder hybrid. The car could be combined with additional variants of the Cayman and Boxster as well as extended-wheelbase and convertible versions of the Panamera four-door coupe, Bernhard Maier, Porsche's sales chief, said in an interview. "We're currently examining what options can be derived from this" hole in the product range, Maier said at the manufacturer's headquarters. "There already are initial ideas that look very promising on paper." "Between the top 911 model and the 918 Spyder, there's a price range that we're not serving, but where other manufacturers are selling one or another product," he added. Porsche SE, jointly owns the sports-car maker with Volkswagen AG, and the two carmakers plan to merge. The combination will bolster VW's luxury line that already includes Audi, Lamborghini, Bentley and Bugatti as it aims to topple Toyota Motor Corp. and General Motors Co. to be the world's largest carmaker by 2018. VW's stock has more than doubled since agreeing to the deal in August 2009. Backed by VW, Porsche aims to double sales to about 200,000 vehicles by 2018 with the introduction of new models and expansion in emerging markets. Porsche should boost deliveries to more than 100,000 this year from 97,000 in 2010, Maier said. The planned product expansion comes as Porsche is enjoying booming sales of its luxury cars. In June, the automaker sold 10,677 vehicles globally, a rise of 29.5 percent over 2010 figures. Six-month sales rose 36.8 percent to 60,659 deliveries, supported by strong demand for the Cayenne and Panamera models. Sales increases "will turn out to be lower in the second half of the year," said Maier, a former executive at BMW AG who took charge of Porsche's sales operations in April 2010. To sustain growth, Porsche plans to adjust model rollouts to have at least one new product coming to the market a year, he said. The highlight in 2011 will be the seventh generation of the 911, which will debut at the IAA in Frankfurt in September. The revamped sports car will have sharper contours, more comfort and better performance than the current model, Maier said. The company will expand its range by introducing a compact SUV in 2013. Porsche has struggled to meet demand for the Cayenne, the brand's sole SUV currently. Demand for the vehicle, which starts at 57,930 euros in Germany, caused delivery times to peak to as high as 12 months in markets such as China. To lower this to less than six months, it will increase production by between 10 percent and 20 percent from 2012, Maier said. The automaker was emboldened to pursue a new supercar after selling out all 500 units of the GT2 RS within two months of the 620-horsepower model's premiere in Moscow in August 2010. The car surges to 100 kilometers (62 miles) per hour in 3.5 seconds. 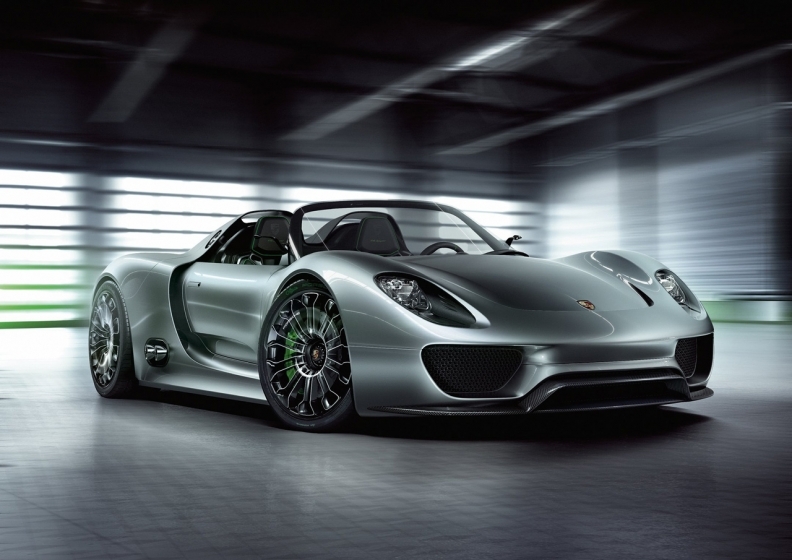 The 918 Spyder, also a limited series, will come to market in 2013. The super hybrid has a top speed of 320 kilometers per hour and is equipped with a 500-horsepower V8 engine and electric motors. "I'm not convinced this is the right course for Porsche," said Stefan Bratzel, director of the Center of Automotive Management at the University of Applied Sciences in Bergisch- Gladbach, Germany. "Development costs for such showcase vehicles are huge. It requires some very creative mathematics to make a plausible business case for such a car." Porsche, which says it doesn't have a timeframe for making a decision on the new car, disagrees. "It makes fundamental economic sense to serve demand that exists in the marketplace in a wise way," said Maier. Supercars have taken on an added value for luxury-car makers as competition tightens. Daimler AG's Mercedes-Benz is introducing the SLS roadster this fall and plans an electric version of the gull-wing sports car. BMW is developing the i8, a hybrid supercar that will be part of its new "i" electric-car sub-brand. "Supercars have great symbolic value," said Bratzel. "They polish the main brand, but I'm not sure an icon brand like Porsche still needs that benefit."